Here is the new Jag JFx 7-seats crossover. Its based on the Acura MDX with a lower roof line. Not unattractive. 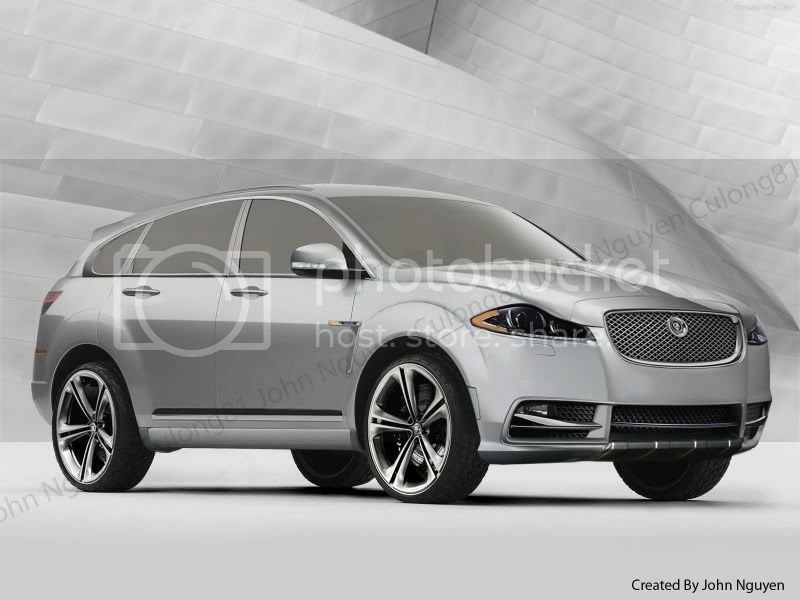 Probably accurate looking if Jaguar would do an SUV. Pardon my critique, I did not like Jaguar creating an SUV for itself (since its sister brand Range Rover has already done so) because IMO it does not reflect Jaguar's prestige. But given the Porsche Cayenne success, I would be wrong to say that there could be no similar achievement for the leaping cat to make fast profits as a way to increase R&D expenditure to build proper (i.e. sedans and sportscars). However, your work quality is excellent! Nice work on the body work and front, I would have kept or used normal SUV tires and rims and not low profile ones. As much as I hate the XJ's roof/rear glass treatment (Theo did a great fix that rid the XJ of its hatchback look by the way), a thick chromed arc of a D pillar could really butch up what is a feminine design. I'd make the headlights meaner and lower the grille so that the top meets the line the fromt facia makes with the headlights. The DLO is also off to my eyes. I'd borrow from the Kia Forte Koup and do the bottom edge of the DLO like that i.e a drop aft the A pillar and then a rising lower edge. A Jag should be swanky and provocative and in my opinion this chop is just a little too tasteful for its own good. While there is something about the hoodline/headlight line that my eyes dislike, the overall impression is positive. I second Acariss' comment about the wheel/tire choice.